Twenty-nine retiring teachers and school support staff members were guests of honor at the annual Emporia Public Schools Staff Recognition May 11 at Emporia High School. 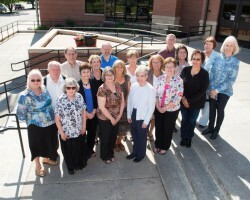 “Collectively, these individuals have devoted 600 years to Emporia Public Schools. Over a span of nearly four decades, they have had a huge impact on the lives of children in our community,” said Superintendent Theresa Davidson. Retiring staff members are: Ann North, social studies, EHS; Sandra Brooks, library clerk, EHS; John Brown, Maintenance Department; Jan Traylor, instructional strategist, Timmerman, Erin Kauffman, instructional coach, W.A. White; Vickie Dinkel, sixth grade science, Emporia Middle School; Larry Ellis, counselor, EMS; Gary Brooks, Maintenance Department; Susan Endres, head secretary, EMS; Ted Keisler, custodian, EHS; John Young, special education, EHS; Deborah Thompson, second grade, Timmerman; Marilyn Harbaugh, building technical support, Walnut; Dinah Rodriguez, food service, Riverside; Diane McCarty, music, Logan Avenue; Rita Solorio, paraeducator, W.A. White; Margaret Quirarte, paraeducator, EMS; Bonnie Jasso, counselor, EMS; Deborah Cunningham, special education, EHS; Scott Capes, science, EHS; Donald Simmons, custodian, Riverside; Jack Heinrichs, German/Spanish, EHS; Sonja Hernandez, Food Service Department; Don Monroe, custodian, Village; Sandra Simmons, paraeducator, EHS; Jim Grimmett, bus driver, Transportation Department; Mike Wilhite, custodian, Village; Donna Hammond, food service, W.A White; and Mary Fraas, language arts, Walnut. During the program, Davidson and Board of Education members Susan Brinkman, Doug Epp, Art Gutierrez and Grant Riles also presented service awards to 40 employees with 15, 25 and 35 years of service. Employees with 35 years of service are: Judy Bell, Susan Pedersen, Christina Pletcher and Stephen Pletcher. Employees with 25 years of service: Diana Delgado, Susan Endres, Diana Higgins, Ted Keisler, Amy Larson, Jill Lynch, Jana Marstall, Karen Myers, Karen Pendlay, Janell Rodgers, Janice Spade, Mary Beth Tabares, Randy Wells and John Young. Fifteen-year service awards were given to: Katie Adams, Laura Albertson, Stefanie Baker, Cynthia Barnard, Angie Bolz, Scott Capes, Rhonda Christlieb, Sheila Eskeldson, Becky Hanson, Connie Keiss, Deanne Kelly, Linda Lane, Jodi McCullough, JoAnn McRell, Tiffany Ochs, Santhiogupillai Paramanathan, Glenda Richey, Kathryn Rogers, Janet Scheve, Lisa Scheve, Lisa Shaver and Carol Taylor. Emporia NEA gave special recognition to 2015 Emporia Master Teacher Carol Taylor, an AVID teacher and instructional coach at Emporia High School. The annual recognition event was sponsored by the district and Emporia NEA, with support from State Senator Jeff Longbine and State Representative Don Hill.